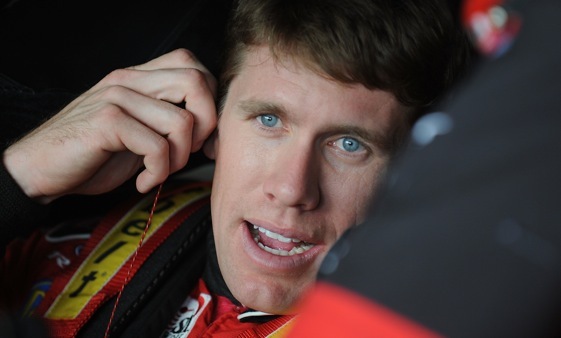 Racin’ Today » Harris: Will Edwards Reappear In Time To Win Championship? Harris: Will Edwards Reappear In Time To Win Championship? Carl Edwards has to be wondering what happened to the magic. A year ago, Edwards was winning races in bunches and throwing a real scare into Jimmie Johnson, who, at the time, likely saw Cousin Carl as the biggest roadblock to his historic third straight title. In NASCAR, the magic can sometimes disappear as quickly as it arrives. So, here we are, one race from the Chase and Edwards, who began the year considered by many the guy who was going to keep Johnson from a record fourth straight Cup title, is probably wondering what happened. Twenty-five races into the 2009 Cup season, Edwards is winless. And now he’s limping on a broken right foot, sustained in a Frisbee game last week. It’s just not going the way he and Jack Roush planned. The bright spot for Edwards is that, despite the failure to reach Victory Circle in Cup, he’s fifth in the season points and a lock to wrap up a spot in the 12-man Chase Saturday night at Richmond. Oh, and despite needing crutches outside the car, he can still use that damaged right foot to hold the gas pedal to the floor without too much discomfort. But, the big question: Is Edwards still a legitimate title contender? No much visible proof of that, though. Of the five Roush Fenway Cup entries, Greg Biffle and Matt Kenseth are the only other drivers in the running for the Chase. And both of them go into Richmond on the bubble, 11th and 12th in the points and with outsiders Brian Vickers and Kyle Busch take dead aim at their spots in the Chase lineup. Last Saturday night, at Atlanta , which has been one of his best tracks, Edwards never got a chance to show if his team has made progress. A piece of debris ripped a hole in his radiator and Edwards was never a factor in the race, finishing 37th. Now, unless he can end his winless string at Richmond, a track at which he’s never won a Cup event, Edwards will limp into the Chase – figuratively and literally. With no victories, he will be seeded behind the drivers with wins in 2009. Crew chief Bob Osborne isn’t too worried about that, though. “Forty points, thirty points, that’s nothing over a 10-race span,” Osborne said last week. “They key thing is to be in the Chase. Last year, with Kyle (Busch), we saw how quick those points can go away. But Edwards and Osborne are well aware they need to pick up their game if they are to compete for a title. Being winless this year isn’t the most telling statistic for Edwards. Worse, he has only seven top-fives and 11 top-10s in the first 25 races. That’s not the kind of consistency the 99 team is used to. At this juncture a year ago, Edwards has 11 top-fives and 19 top-10s. “When people ask me if I’ve had a good season this year, I never know quite what to say,”Edwards said. “We’ve been pretty competitive at times, and we’re in good position to be in the Chase, but there hasn’t been much to get excited about. Maybe they can conjure up some of that lost magic. Right now, Edwards’ title hopes appear to be little more than an illusion.